Browse mode: This is the default mode when opening the Tool (see picture below). Edit mode button: This mode lets you create and edit tours. 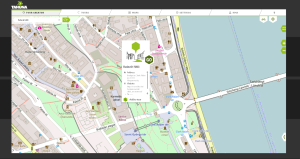 The background of the whole tab area is a map. 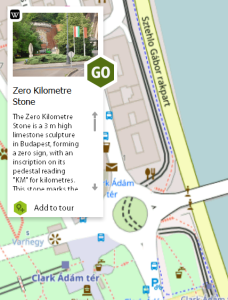 It can display downloaded offline and online maps (if you have a working internet connection). The map is able to display roads, areas, selected tours, POIs, etc. the same way as the Tahuna App or the Teasi device. You can pan the map by dragging it with the mouse. To zoom in/out, use the + zoom in/ – out buttons or the mouse wheel. You can switch the map to full screen mode – this will make the Tour Creator tab fill the whole screen area (with everything outside the Tour Creator tab hidden). Clicking this button again restores the Tool to its previous state. There are two other buttons that affect how the map is displayed: the ‘Activity’ or ‘Profile type’ selector () and the ‘ Map options’ button (). 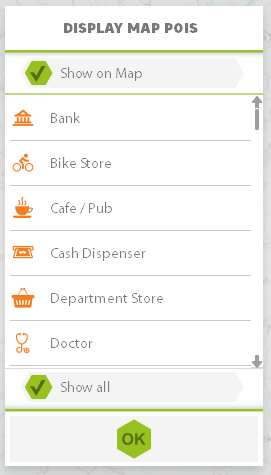 You can select the POI categories to be displayed on the map by clicking the ‘Display map POIs’ within the ‘Map Options’ menu (see the picture above). 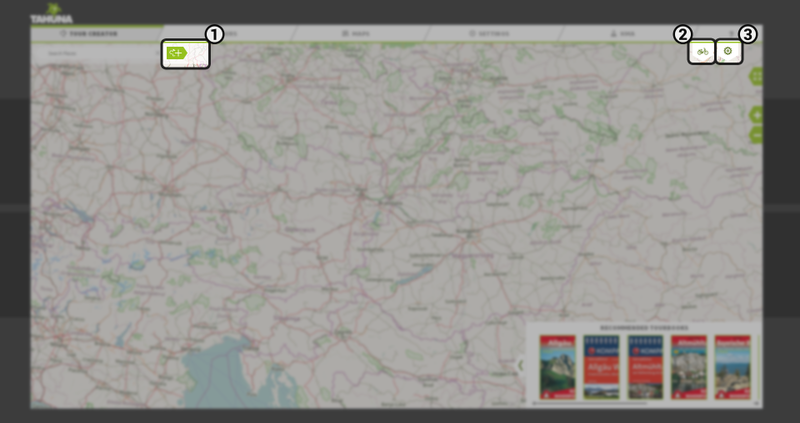 When you select ‘Display map POIs’ a popup titled “Display map POIs” appears (see the picture above). You can choose to ignore or display all POIs by checking the “Show on Map” checkbox. When the checkbox is cleared, all options disappear, only an OK button remains (this closes the popup). When the checkbox is checked, a list shows all available POI types. Each of these have a check mark – toggling this enables/disables the category. Once a POI category enabled, it will be shown on the map. Otherwise all POIs within the category will be hidden. There is also a “Show all” checkbox that lets you select/deselect all POI categories at the same time. To close the popup, click the ‘OK‘ button. 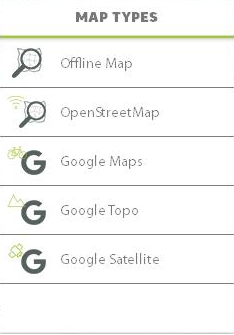 To select the kind of map to be displayed, select ‘Map types’ within the ‘Map Options’ menu. If the country you are looking at is downloaded, you will see the detailed map with POIs, etc. If the country you are looking at is not downloaded, you will only see the “base map“. This is a low resolution texture of the terrain with some text indicating bigger cities or areas, but has no detailed map data on it. Selecting any other item will display the respective online map (only possible if you have a working internet connection). POIs from downloaded offline maps will be shown over the online map layer. 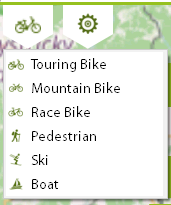 The map details and the tour planning will change when you change the profile type (only for offline map): for bike profiles the map shows cycle routes with bold lines. The ‘Pedestrian’ profile highlights hiking routes. The ‘Ski’ profile switches the map to a different color scheme (whiter colors to resemble a snowy terrain) and makes ski pistes and lifts visible. The ‘Boat’ profile will display boating-related POIs on water (e.g. lighthouses, buoys). The Search Box is always visible at the top left of the map area (see the picture above). You can enter your desired search terms into the empty field (it says “Search Places” when empty). Searches can only be performed with a working internet connection. If the Tool detects a lack of connection, the search box is disabled. Clicking the empty area of the search box opens the recent results list (these are denoted by a clock icon). Click any item in this list to perform the search again. If you start typing in the box, the software will show autocomplete suggestions. The text entered will be highlighted (bold). Each item has an icon that shows its source (Google or Wikipedia). POIs are searched below a certain zoom level and within a limited radius of your current position. Select the desired result with the arrow keys and press enter to jump to it (the autocomplete list will disappear). You can also do this using your mouse. Wikipedia results will display the image associated with the Wikipedia article (see the picture above). These search results are based on Wikipedia articles. The current map is used as a base for the search on “how far” the search results can stretch. If you entered an exact match for a Wikipedia article title, you can find results from all over the world. Google search results are limited to addresses only. The suggestion list will offer addresses as search results only after other results types (Wikipedia). The final result list will only display exact address results (if there are any). Clicking a search result will open it on the map. The result will be shown as a popup containing the relevant information. If you searched for a place (e.g. 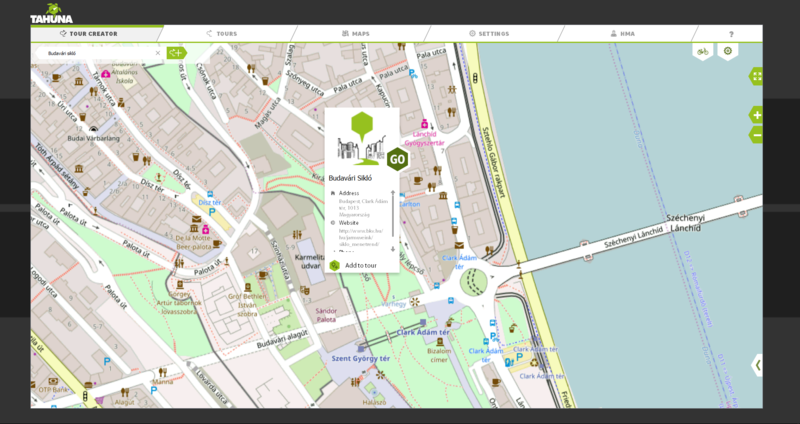 City), the map will automatically jump to the location. Once you accept a search result, the map jumps to the location and the search result window is opened (see the picture above). The search result window is the same as the POI Details Popup. It has the title and description of the found result. If the result originates from Wikipedia, it contains an excerpt of the article’s text, and a Wiki icon indicating its provenance. In case of a Google result, the detailed address is displayed as it’s description. The result window has two available options: ‘GO’ and ‘Add to tour’. These have the same functionality as in the POI Details Popup.